My daughter took this photo in Hyde Park yesterday. I knew that we would see a robin. The thought occurred to me as we left the house. My late mother passed away a year ago on December 5th and my thoughts are on the family gathering that will take place next week. Just after she had passed a robin used to sit on the rubbish bin outside the office where I was working. It used to cheer me as I associated it with her. Several people have told me that they also associate robins with people who have passed over, as a sign that the spirit of the deceased is looking over them. They see them as messenger birds. Each robin has a unique breast pattern, and it is possible, although not too easy to recognize them individually. There are numerous myths of the origin of the red breast and they all relate to acts of kindness by the robin.There is the myth that the bird singed its breast in the flames of hell whilst trying to give water to sinners. Another myth decsribes how the tiny robin flew to Jesus’ Crown of Thorns, and tried to pluck the thorns away with his beak. But the bird just managed to tear his own breast on the thorns. It is said that that robins have worn red feathers on their chests as a badge of honour since then..They have the ability to nurture themselves into true adulthood. The robin’s red breast symbolizes the activation of creative energywhich incites growth. This also connects with the Robin’s traditional connection to spring which is the season of renewal. Many things that afflict us psychologically derive s from childhood experiences.We need to let go of them in order to be renewed. Then we can nurture ourselves and others effectively. It is said that when you see a robin it will bring about will incite new growth in all areas of your life. You need to believe in yourself. Barriers will unravel, and confrontations would just be for show, not really effective. Robins eggs are powder blue which is the colour associated with throat chakra. Robin can help you to express yourselves positively in all you do. It is said that if you meditate upon Robin, the right path will be shown to you. I will share another incident that happened to me with a robin that was to do with my path and not about anyone who had passed over. I had previously worked with a spiritual group and I had met some new people with whom I had the opportunity to work with. I was standing by a tree thinking and wondering whether it was the right move. Suddenley a robin landed on a branch close to my head and just sat there looking at me intently. That gave me the confirmation that I needed. My old group leader had been called Robin. This entry was posted in Animal Work, Dreams, Language and The Unconscious, Magickal Workings, SOW School Of Wyrdynamics, Uncategorized and tagged Robin. Bookmark the permalink. the only reason im here is because a robin has showed real curiosity in me when i go into the country. 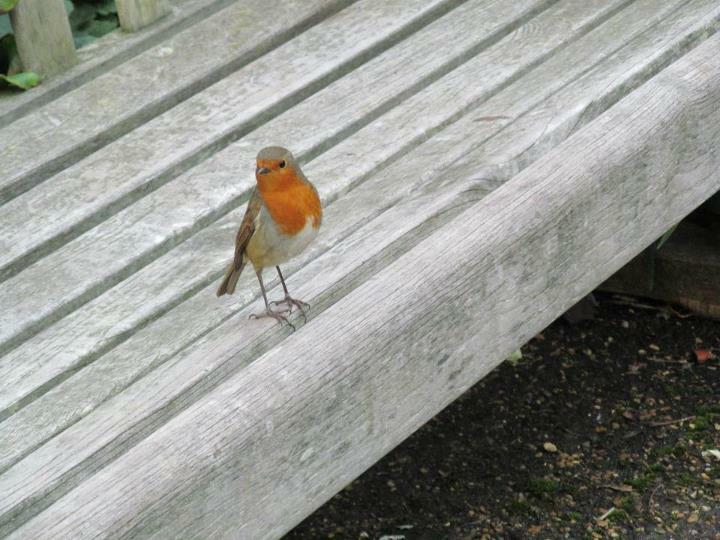 my wife died of cancer 1st feb 2012 and when she was going through her sickness a little robin was to be seen walking not 6 yards from us many a time as we were at a monastery retreat and walking around the grounds. then yesterday a robin appeared only 3 feet away from me and staring intently at me as he sat on top a fence almost eye level. he/she showed absolutley no fear and a knowing, understanding or acknowlegement came into me. i actually asked it “what do u want?” it was quite erie yet so intriquing. there was almost a familiarity between us and i felt protected and assured after. i dont say this lightly as i am not really into the esoteric. but it was just that feeling…almost like a voice saying i know i know but im here. i miss my wife dearly. i think u need to be away from the noise of the world which i was in order to experience these things. the wee bird was just too close and stared too intently for this to be a natural wild bird. its actions were too familiar and forward. not nervous or afraid at all. it even flew a foot to the left of my head and settled not 3 feet on a bank with its tail turned toward me. almost as if it knew and trusted me knowing i wouldnt hurt it. again that knowing or something. its hard to explain. I do understand what you experienced. It is something you “know” with a certainty when you have such an encounter..It doesn’t need explaining. It just is. I am sure that you will have many more encounters. Hold them close to your heart. They are telling you that everything is ok. You will be alright and are watched over.